But inside the Moscone Center, it was mostly business. CEO after CEO stood up to declare commitments to reducing carbon use, to everything they do now but cleaner and more efficiently. “Getting to carbon-free” was the byword of the summit. And it would happen without affecting the profitability of the companies making those commitments. In the rush to give everyone their few minutes at the mic some of the counter messages—about climate justice, about offering incentives or opportunities for people to make deeper changes—were mostly ignored, or brushed aside. “It would take my grandfather, who lives in Uganda, 129 years to emit the same carbon as the average American citizen,” she said. “The emissions that are damaging our planet are being produced by rich people, but the repercussions are hitting poor people the hardest.” And while poorer and less industrialized countries are making commitments to cleaner and renewable energy, that won’t make up for emissions coming from industrialized countries. “The pursuit of profit is not in conflict with doing good,” he declared. This seemed to be the real theme throughout the event. 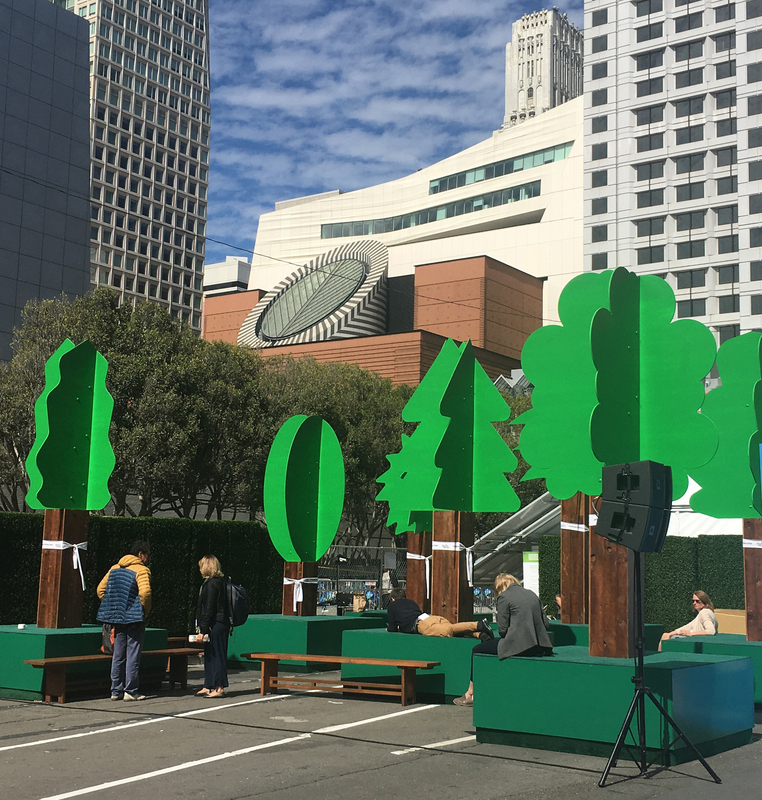 The summit featured fake trees, because, um, yay trees? Commitments were made, agreements were signed, speaker after speaker made big announcements about how soon they pledged to go carbon neutral or how much money they would invest in climate solutions; business leaders touted their energy efficiency achievements, declaring that it was definitely possible to “do good while doing well”–in other words, none of them were risking their bottom line. Civic leaders patted themselves on the back for committing to zero carbon by 2030, or 2045, or 2050, depending who was talking. But youth leaders and indigenous leaders and leaders from countries outside of the industrialized nations kept reminding people that the investments were nowhere near enough; that the world’s attention was on the dangers of the planet, but concrete action is too slow in coming; that there isn’t a lot of time left to get something done. “Africa,” he said, “is going to industrialize” and unless dramatic changes happen soon, “it will be forced by circumstance to use old technologies. It will repeat the mistakes of the other industrialized nations, and then everything you are doing here might be undone,” he said. But the industry leaders were focused on their own promises about changing from fossil fuels to electricity; the oceans, it seems, are someone else’s problem. The Global Green Bond Partnership was launched to support cities, states, regions, corporations, and financial institutions to accelerate the issuance of green bonds. Los Angeles mayor Eric Garcetti was one of the civic leaders who gave a speech, saying that L.A. was the first city to sign the C40 Fossil Fuel Free Streets pledge. “Los Angeles is number one in traffic,” he said, but its transit system is growing, and city voters passed “the largest transit initiative in U.S. history” last November, he said. In addition to the C40 pledge, he said, both the L.A. and Long Beach ports have committed to becoming completely zero emission by 2025. The pledge commits cities to buying only zero emission buses by 2025—but why not start now? It also contains a promise to create people-friendly planning, increase the rates of walking, cycling, and public transit use while reducing fossil-fuel vehicles. Unfortunately, Garcetti forgot to mention the biking and walking part, as did a depressingly large number of the speechmakers at the summit. The San Francisco Bicycle Coalition hosted a bike ride as part of the summit. Here the group stops at City Hall to discuss the city’s achievements and work still to be done. The summit’s focus was on the pledges of business and civic leaders to meet or exceed the goals of the Paris Accords, and nobody pretended it would be easy. Civic leaders especially addressed the complex interconnected issues of spatial planning, housing, transit, electric vehicle infrastructure, and trees. But focusing on these commitments made it harder to hear the voices of people who don’t have money at their disposal. The heavy reliance on increasing electric vehicles is a good example of this: yes, it needs to happen, and yes, it will take a lot of money. Those who can afford electric vehicles should buy them A.S.A.P. and cities and counties and states should be helping by investing in charging stations and encouraging others to do so. But people also make shifts in their own lives—we must drive less, for example. Not a whole lot less (well, for some people) but everyone has to be more mindful of the environmental costs of every trip. But there was too little of this at the summit. The focus on industry’s bottom line, and whether it’s possible to “do good while doing well” distracts from the urgency of actually making the changes that are necessary to stop the environmental and climate degradation we are all responsible for. Even Jerry Brown’s announcement at the end, that California will launch “its own damn satellite” to study the effects of climate change, misses the mark. We already know what changes we need to make. We already know we have to stop investing money in infrastructure—highways, parking lots, sprawl—that contribute to greenhouse gas emissions. It would have been better to hear about that than a satellite. people, who can burn it. But public policy says we won’t because we don’t want 300 million people contributing to global warming? Every climate summit falls short….especially when the people who matter most arrive in transportation that’s not “Climate Friendly”. When a guy who shows up in a Mercedes tells you we need to curtail our purchase…….of Mercedes, you’ve already surrendered your credibility in the argument. Don’t preach what you don’t practice, don’t advocate what you wont do and don’t try to legislate what makes energy more expensive when you can afford a price increase. When diplomats, bureaucrats, politicians and celebrities gather together for a cause the hypocrisy is so thick you could stir it with a stick. – America is the world leader in environmental stewardship even if we do nothing. US CO2 emissions are below 1995 levels and lowered while European nations whom were treaty signatories only saw their emissions rise despite huge renewable investment? – The value of American oil, gas and coal resources that are currently recoverable with present technology is estimated at near $50 trillion — which is more than double our national debt. Assuming dems aren’t put in charge again to double it once more. MELANIE CURRY EPILOG — When solar panels grow old, they become unusable. Solar panels are made of TOXIC MATERIAL which conventional hazardous waste dumps don’t presently accept. There is no recycling technology for old solar panels because the issue is not even acknowledged. Wind turbine farms that go on for miles and miles are BLIGHT. No trees or buildings can be near a wind turbine because it needs smooth incoming airstream, or else it won’t turn. The blades are like airplane wings. Thus, the outgoing airstream is much rougher. The next wind turbine downstream of it won’t work as well because it is receiving rougher incoming airstream. Thus, a very, very big wind farm won’t work because many of the wind turbines will be receiving incoming airstream that is too rough, caused by their upstream neighbors. Telsa batteries grow old, too. They are made of toxic materials, the same problem as solar panels. Natural gas is the clean, inexpensive energy we need. The old buses and garbage trucks powered by natural gas have signs that tell you so. Yet, California is embracing future blight and hazardous waste material while outlawing natural gas. MELANIE CURRY 4 OF 4 — California’s Global Climate Action Summit is therefore POINTLESS! No drought or flood can be mitigated by bashing carbon dioxide gas, not when warming is caused by volcanic activity. This is natural cause, not man-made cause. California’s methane gas emission law is particularly insulting because methane gas turns into carbon dioxide gas when the sun rises. And yet, only 4 molecules out of 10,000 air molecules are carbon dioxide. Dairy farmers and cattle ranchers are being spitefully hurt, probably for being Republicans. Natural gas is the inexpensive CLEAN energy that we need. Every catalytic converter in a car or truck maximizes carbon dioxide emissions (clean) while minimizing carbon MONOXIDE emissions (causes smog). Yet, California seeks to OUTLAW natural gas. The fad of “Carbon-this, Carbon-that” of which YOU, Melanie, are a part, just breeds ignorance. It makes people confuses carbon dioxide and carbon monoxide, while forgetting that soot is carbon or that diamonds are pure carbon or that we humans are made of many kinds of complex carbon-based molecules. “Carbon” is NOT carbon dioxide. Where the world is truly harmed is when young people are taught to depend on data correlation, with no consideration for underlying cause or mechanism. So far, medical science still works as it has, but the political muscle of the Al Gore Climate Change/Global Warming Agenda could make finding good physicists or engineers difficult. The worst has yet to come. STOP THE SENSELESS WAR ON CARBON DIOXIDE! MELANIE CURRY 3 OF 4 — Did you pay attention when 3 VOLCANOES blew their tops earlier this year? Hawaii, Guatemala, Ecuador… There have been earthquakes in areas of past volcanic activity like Yellowstone Nat’l Park (over 150 quakes in 1 month) and Indonesia, which is on a volcanic rim. A geologist in New England reported a few months ago that molten material was detected closer to the Earth’s surface than before, which makes the ground a little warmer. THIS is the real reason for the warming, not carbon dioxide gas. Furthermore, there is, too, a lot of Greenhouse Effect in the atmosphere from CLOUDS, which are made of liquid water droplets carrying solid dust particles. Liquids and solids are far more capable of trapping heat photons than any gas. Humidity is a much weaker, secondary cause of Greenhouse Effect, but of course, only when the weather is humid. In 1997, the Los Angeles basin was humid (like South Florida) for the first time in my adult life, which goes back to the mid-1970’s. Yet no one dares to mention that the climate in L.A. has changed from dry to humid when discussing Climate Change. Climatologists have completely MISHANDLED the issue of the climate changing. MELANIE CURRY 2 OF 4 — What about having carbon dioxide gas cause higher temperature? Let me show you why the mechanism really doesn’t exist. The mechanism of Greenhouse Effect is not that hard to understand, but almost nobody cares how it really works. Heat photons move in wavic fashion. Ones from a hotter source have shorter wavelength that those from a cooler source. This is not to be confused with heat intensity. It is more like color that humans cannot see. The shorter wavelength photons can sneak between molecules of a substance more easily than the longer wavelength photons. The heat photons from the Earth have about 15 microns wavelength, but heat photons from the sun are only 0.5 microns in wavelength. This is not the light from the sun, only the heat from the sun. [1 micron = 1 millionth of an inch] Inside glass, the 15 microns photons (Earth) are blocked, while many of the 0.5 micron photons (sun) sneak through. This is the Greenhouse Effect. For substances with molecules farther apart, blocking photons is less and less likely. If the substance’s molecules are very far apart, the substance can’t block photons. Its molecules can only be hit at random by photons. Carbon dioxide gas in the atmosphere is only 4 molecules out of 10,000 air molecules. Carbon dioxide gas does NOT cause significant Greenhouse Effect in the atmosphere. It just increases in concentration when the temperature rises. Notice that the Cause and Effect are backwards from what Climatologists think they are. MELANIE CURRY 1 OF 4 — The Al Gore Climate Change/Global Warming Agenda has grown into a GODZILLA MONSTER that wrecks civilized society by grossly misinforming the people of the world. This Godzilla tramples real science in the name of politically correct so-called science. Climatologists are really glorified weathermen who understand only data correlations. They see that “A” goes up when “B” goes up, but they don’t know why. I have looked at a textbook for a related field, Meteorology (weathermen’s major). It had no Physics or Chemistry or more than the simplest Mathematics in it. Meteorology was taught as a Social Science by the University Of California. Ice core samples (carbon dioxide concentration) and tree ring data (temperature) correlate well because higher temperature causes production of carbon dioxide gas. How do I know this? It is basic Chemistry. Fossil fuel vapor reacts with oxygen when heat is sensed to make carbon dioxide gas and water vapor. Heat doesn’t have come from a flame, it can be the sun rising every day. There is always more carbon dioxide gas when it is hotter. This conference sounds like a lot of fun! Shaking hands with Hollywood celebs, drinking special “green-colored” cocktails, wearing pins with all kinds of clever slogans! And for a few people who love to append the word “justice” to every ideological issue and bias they harbor, to play a race card as in this article. Anyway why were the usual suspect protesters protesting a conference whose goal was what they want anyway? Did they want more global warming? 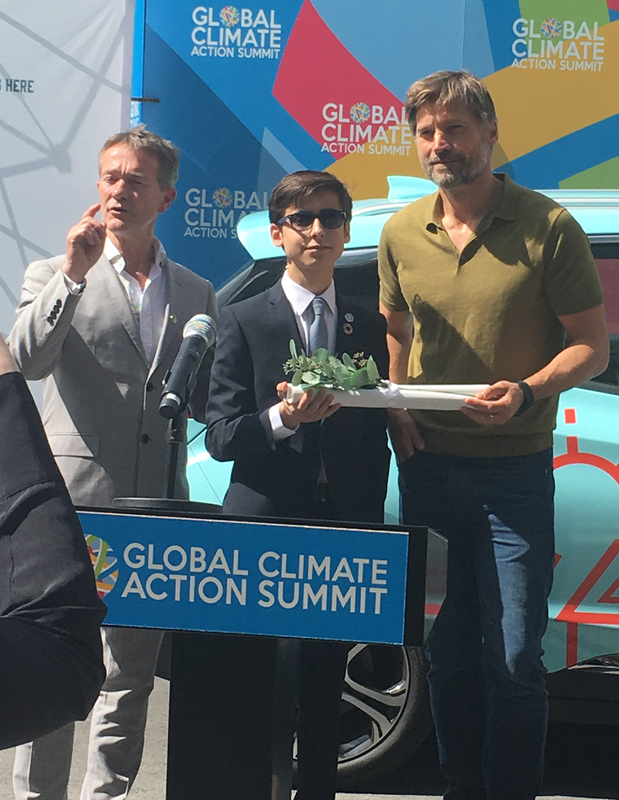 The point of California’s Global Climate Action Summit was to give elected officials and bureaucrats the ability to rub elbows with celebrities at cocktail receptions, of course! "Green driving"--if there is such a thing--means practicing smooth acceleration, keeping up good maintenance, and avoiding unnecessary weight in your vehicle, according to the DMV Driver Handbook. Now it also recommends that drivers "consider" a zero-emission vehicle. Average temperatures in California will continue to rise, sea levels will go up, and snowpack will shrink, affecting the availability of water for all uses.